Tomorrow is what I call Black Friday, when hunting is banned in Wisconsin, on the day before the 9-day gun deer season. That means no grouse hunting for at least ten days. 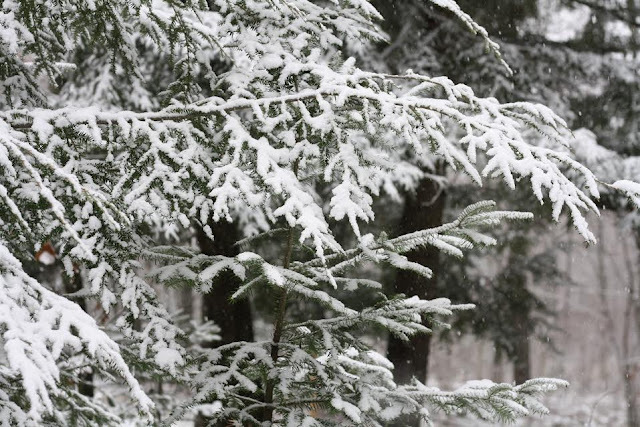 If you haven't experienced the gun deer season in Wisconsin, it's a bit like a war out there as 600,000 hunters take to the woods armed with high-powered rifles. 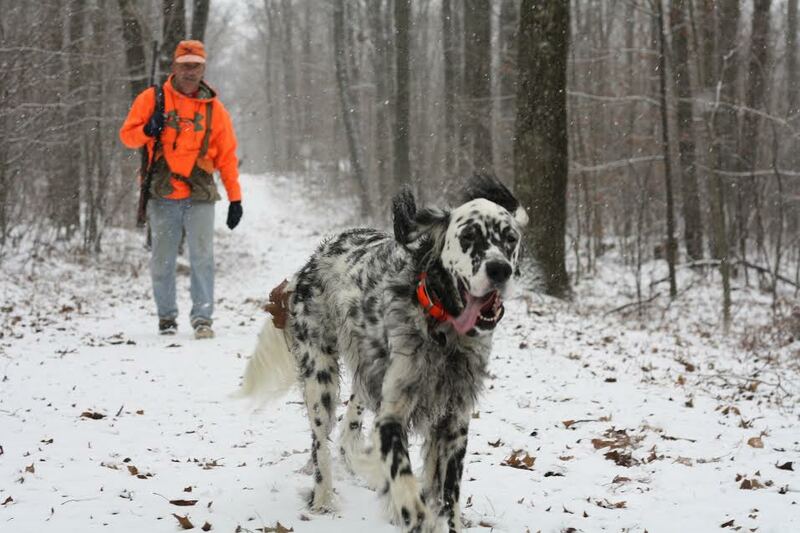 For safety reasons, our setters don't get near the woods during this hunt. I'm pretty much a meat hunter, so I go out and try to get some venison and fill the freezer. This weekend I'm heading down to SW Wisconsin to hunt with a friend and his family in the hill country down there. I've never deer hunted south of the 45th parallel so it will be a new experience. We had a good hunt today, the day ending with me losing Fergus on point in a large popple cutting. I was walking along thinking about something I can no longer recall when I realized Fergus's bell was silent. I started to move in the direction where I thought I had last heard him, but after a couple of minutes I still hadn't located him. (After this season, I'm breaking down and buying a beeper collar.) So I yelled for him, fairly loud, then loader, and when I really roared I heard the faint clang of his bell. I started to hustle toward where I thought I had heard it, but I still can't find him. Now I'm starting to think about wolves since we're about half a mile where a depredation had occured in September. So I beller again, and I hear the clank of the bell, this time closer. Finally I spot Fergus through the popple. He's pointing and probably wondering what took me so long. "You got the bird?" I ask, and he relocates once, then twice. I try to head the bird off because it's moving, but I can only scramble so fast through that nasty popple. I got a glimpse of the bird as it squirted out ahead of us, and I saluted it with a shot as it flew off unscathed. Whatever comes our way, though, I can rest content as it was an excellent season. Now I better go find my rifle. Pennsylvania's daily limit on grouse is two per birds. Wisconsin's is a much more liberal five, which in my 25 years of hunting these birds has been a rare occurence. I'd be fine if the DNR cut the daily limit to three, the limit of birds I grew up with pheasant hunting in Iowa. Now pheasants are not grouse, but you can understand how my mind equates the two. On days when I get three grouse, I have an ingrained reluctance to pursue that fourth and fifth bird. The Iowa limit of three seems just fine to me. 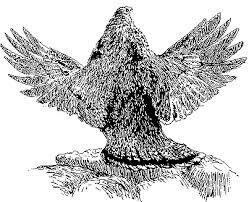 I have gone after that fourth and fifth bird, something I did much more often as a younger grouse hunter, but not so much these days. The number of birds I shoot doesn't seem as important as when I was a zealous younger hunter. What struck me about these two birds is the size and color difference. I have been shooting mostly juvenile birds this season, which bodes well for upcoming seasons. This hunt, however, I shot a huge, what I call, cinnamon bird. It's a brown-phased bird, but has lighter cinnamon tints, particularly on the ruff. The tail band is also a much lighter brown. An altogether beautiful bird. I saved the fan as well as some ruff feathers. With a bit of frost this morning and high temps around 50, today felt like the first day of fall. We didn't have to worry about Fergus overheating or running out of water before we finished a loop. We ran into a fair number of woodcock, so many that Susan decided to get out the camera. It seemed like every time we got on a grouse there was a woodcock distraction, although I'd say woodcock are a nice distraction. Even though it was the Wisconsin youth deer hunt weekend, we didn't run into any kids toting rifles. We did run into a couple of other hunting parties, though, out enjoying the October weather. No one enjoyed it more than Fergus, however. It's been pretty tough getting shots this season so far -- both with a shotgun and a camera. Seems to be good numbers of birds in northern Wisconsin, grouse and woodcock, but I've been mostly hearing them rather than seeing them. I did get one good look at a grouse last week that flushed simultaneously with a woodcock. It crossed right to left in front of me in fairly open woods after it flushed out of a mix of popple and hazelnut. I saw it so well I could see the mottled breast feathers as the bird banked in front of me. Most of the birds, however, are disappearing into what Susan calls the Green Curtain. Camera work is also difficult this time of year with all of the brush between the dog and the lens. Many shots seem like nothing but a green blur. I couldn't help myself a few days ago when Jenkins locked up on a chipmunk in our front yard. I ran in the house, grabbed the camera and snapped a few shots. Looks sort of like a classic New England shot in an old abandoned apple orchard -- but I know there's a rodent on the other end of this point. The good news is a few leaves are starting to spin off the trees. Things will open up out there shortly. A little frost, a little wind, and the trees will be stripped bare. I'm debating where to hunt this Saturday, the woodcock opener here in Wisconsin. For the past week, I've been trying to avoid woodcock and hunt grouse, and I hunted several coverts where I typically run into few, if any, woodcock. But apparently this isn't a typical year. Tuesday, Fergus pointed ten woodcock in a section of county forest where I usually see just grouse. My theory is that our wet summer and wet early fall have moved them to higher ground. I imagine we'll go out Saturday and put up just grouse, and if that's the case, I won't complain. 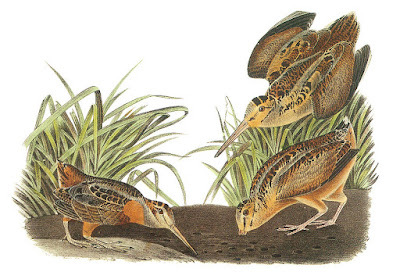 Saturday, September 23rd, is also National Hunting and Fishing Day, and I can't think of a much better way of celebrating it than a woodcock hunt. I'm sure Fergus and Jenkins agree. With the grouse season opening next weekend, I figured we needed a little tuning up, but the temps and humidity have been nasty around here for most of August. This morning, though, the temperatures dropped into the mid-40s, so we headed out to the county forest. Fergus pointed a woodcock about 50 yards into the cover, and Jenkins backed. I stood and watched the tableau for a half a minute or so. A good point is better than a strong cup of black coffee for stirring me up. I had a great look at it when I flushed it, which always happens in the pre-season. The dogs were birdy halfway through the covert, and a grouse busted out of a tree about ten feet up. That really jacked us all up, like a double espresso. Overall, it was pretty quiet, though, as I expected more woodcock. Can't wait for next weekend. Now, I need another coffee. Interesting story in Rolling Stone about Kris Kristofferson and Lyme disease. His doctors thought he had dementia or Alzheimer's until one of them tested him for Lyme disease early this year, and the test showed positive. After three weeks of anti-biotics, he was back to his 80-year-old self. 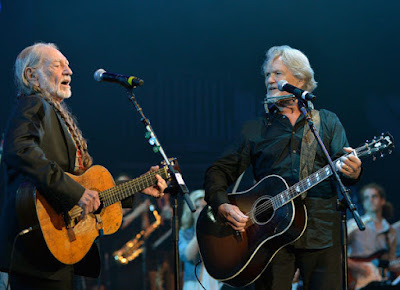 He's even scheduled a few shows this summer with Willie Nelson. 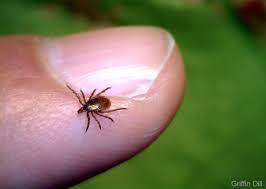 Since I hunt in Wisconsin, one of the most deer tick infested places in the U.S., and live in the county in Wisconsin which in 2015 recorded the most confirmed cases of Lyme (558), I've suggested to my wife that she first test me for the disease if it seems like I'm losing my mind. That could get expensive. Grouse numbers are up one percent statewide for 2016, according to the recent drumming counts from the Wisconsin DNR. The central region saw the greatest increase over 2015 numbers at eight percent, while the northern region saw a four percent increase. The southwest region, however, recorded a 27 percent decrease, which is bad news for hunters in the coulee region. Since most hunters pursue grouse in the central or northern regions, this fall looks to be better than last year numberswise. The DNR says "declines in breeding grouse numbers may have ended till the next decline in 2021 or 2022. Good nesting and brood rearing conditions this summer should set the stage for the cyclic increase in the next 4-5 years." Fergus and Jenkins are seven and four years old, and with the grouse cycle tending up, they should end their hunting years on a high note. See the Wisconsin DNR's 2016 drumming survey for more info. 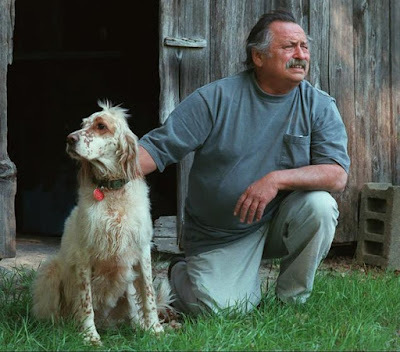 Jim Harrison, author of over 30 novels and collections of poetry, died last Saturday. See npr article or Outside article for more info. Harrison didn't write specifically about grouse and woodcock hunting or doubleguns and setters, but these things crop up continually in his writing. Julip, for instance, is a novella about a bird dog trainer and setter lover from Ashland, Wisconsin. Brown Dog is a collection of stories about a character from the UP of Michigan, where Harrison owned a cabin for years. In one of those stories, Brown Dog says, "You can't even shoot a grouse or a deer properly if you're vaguely upset about something." Words to live by. 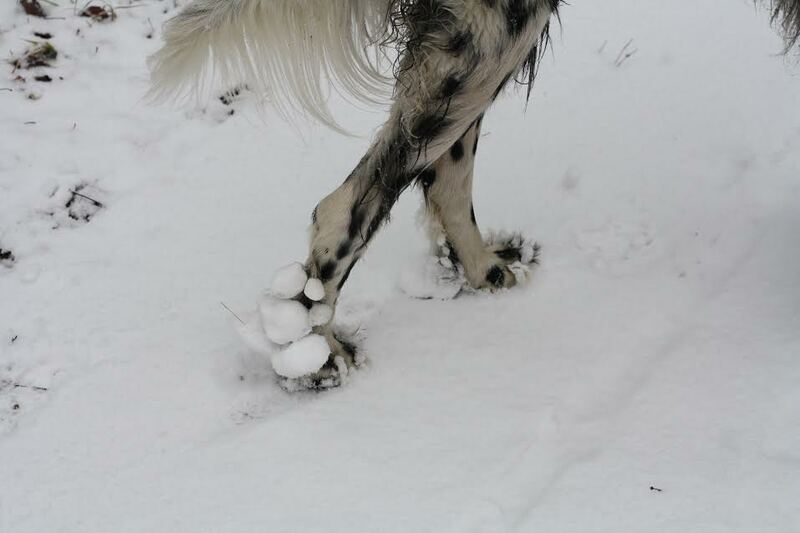 Now go and smell your dog's feet after it has romped in the yard, and you'll understand. From his writing I knew that Harrison occasionally drove through Wisconsin on Highway 64, a highway about 15 miles from my home. One of my coverts I call Club 64 because it sits right on this highway. For years I've had this fantasy that Harrison would be driving by on 64, see me with my setters and screech to a stop. We'd then proceed on a short hunt. In the long version of my dream, Harrison stopped by after the hunt and we cooked up a meal of grouse or woodcock and talked the evening away about dogs and literature. I never got to hunt grouse with Harrison, but the next best thing is all of the books he left us. That's almost as good. I don't think I have ever hunted on January 31st, the last day of the Wisconsin grouse season, but with temps in the mid 30s, we figured why not and headed out the door with both dogs. They haven't hunted for over a month, which was evident by the way they tore up the cover for the first 15 minutes or so. I probably should have just taken one dog, but I couldn't see leaving one behind since it would be until next September before we got out again. They settled down eventually, and we had a wonderful last hunt of the year. We did see/hear a half dozen birds, and lots of tracks, some fresh, others days old. I think dogs have a more difficult time scenting in the snow, especially when the birds are buried beneath the snow. The last bird, Fergus nailed in a clump of balsam firs. I walked in on his left, and the bird flashed through the green on the dog's right and disappeared. It was a tough shot, but I've hit shots like that before. However, when they fall I say to myself, "Wow, I actually hit that bird." We followed it up, but I had simply missed. For once, I was happy to miss a bird, though. That grouse only had a few more months to survive before spring when the drumming would begin, the grouse in this cover hopefully flourishing.